As of Monday 4th of February, changes will be implemented to the existing cattle movement regulations. These changes involve a shortening of the validity period of certificates, a constraint on calves less than 10 days of age leaving the holding of birth, and mandatory destination details on all movement certificate's applications. Previously, farmers had a period of up to 30 days from the date of approval to move animals. As of February 4th 2019 the validity period of certificates will be shortened to a maximum period of 10 days. Up to now it has not been required to provide details of the destination of animals being moved out. However,this will no longer be permissible from Monday 4th of February, it will become mandatory for any farmer intending to sell to complete the destination herd on all applications for a movement certificate of compliance. Under the changes to the existing cattle movement regulations there will also be a Ten-day age limit to move calves from the holding of birth. Thereby the movement of calves less than 10 days of age will be prohibited. 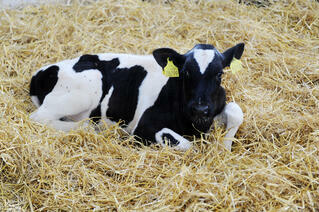 There are exceptions to the ban whereby issues concerning the health of the calf are in question. Likewise there are some exceptions in other circumstances such as the death of a dam, in the event of this the farmer's regional veterinary office should be notified. Upcoming changes to existing compliance movement requirements to be implemented from Monday, February 4th. The new regulations will undoubtedly take some time to adjust to. It's ultimately the farmer's responsibility to adhere to new regulation however Herdwatch can help. Herdwatch allows farmers to apply for movement certs in seconds through the app. When you sell animals privately you can apply for the movement certs on the spot and have the movement completed before the animal even leaves the yard! 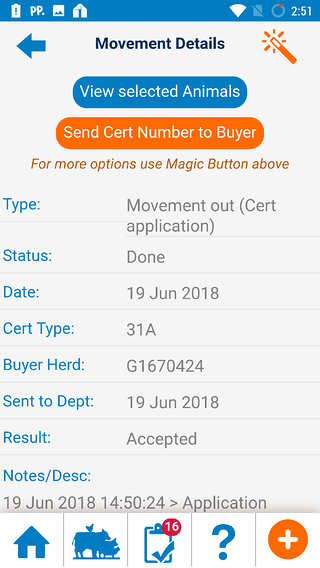 When you apply for a movement cert in Herdwatch, you can also send the movement cert number via a text to the buyer - this completely eliminates the paperwork when selling cattle privately. The movement cert will also be emailed to you by the Department of Agriculture, which can be printed out, signed and posted to the department to complete the movement. You can then tap on the link in the text and this will notify the animals into your herd if your using Herdwatch. If you are not using Herdwatch then the link will let you set up a free Herdwatch account that will let you notify animals into your herd. Saving you time and ensuring that your always compliant. Apply for all movement certs on the spot through Herdwatch. Join over 10,000 farms using Herdwatch to save time every day on farm paperwork. Herdwatch is fully compliant with Bord Bia and EU quality assurance standards. It is fully integrated with ICBF so farmers can see their breeding, milk records and EBI/Eurostar information in the Herdwatch app. Getting set up on Herdwatch has never been easier, farmers can now simply download the app and sign up to our FREE PLAN.